The in-depth shoeing advice presented over 100 years ago in this 304-page book will help you place many of today's shoeing challenges in proper perspective. 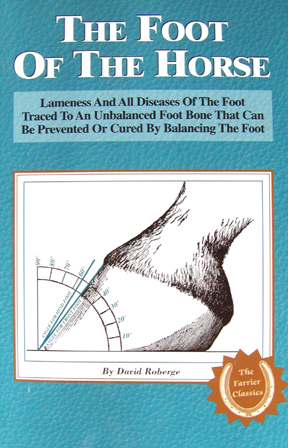 First published in 1894, the book outlines numerous rules for shoer's based on David Roberge's 45 years of working with a footcare system in existence since 1850. Besides offering detailed advice in 18 general areas of shoeing, this valuable reference zeros in which detailed explanations on 424 specific items that still relate to your everyday shoeing concerns.